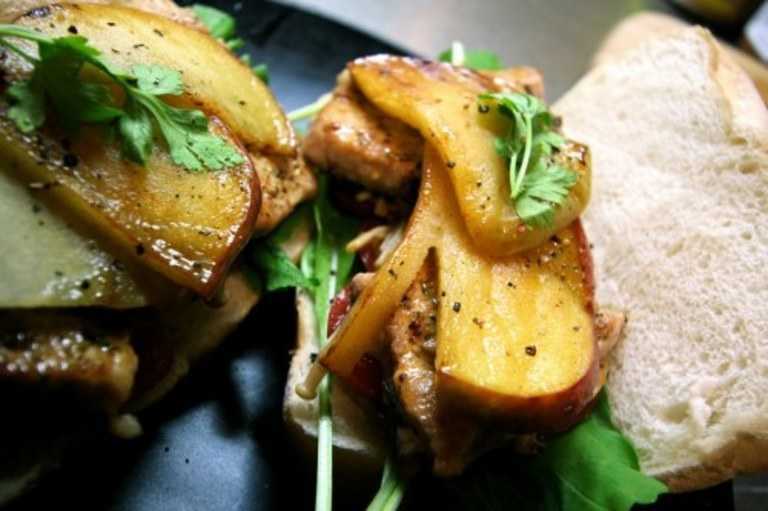 Pork and Apple are a fabulous taste combination. Try seasoning your pork with a little cumin to bring out the meat flavour, which adds to the overall taste contrast. 1. Bash up your herbs with the garlic and a little olive oil. Season your pork with salt and pepper, then rub the herb mixture over the meat. Leave the flavours to develop for a while in the fridge. 2. Heat a griddle pan until very hot. Seal the pork on both sides and bring the heat down. When the pork is about 5 minutes from being perfect, add the apple slices to the pan and the knob of butter. Sprinkle a tiny amount of cinnamon on the apple slices. Allow to cook until soft. 3. Remove everything from pan. Build up layers on rustic bread of salad greens (mushrooms might also be nice), your pork - thinly sliced - topped off with the apple. Eat!